I finally bit the bullet and got myself a set of lockable hard side boxes. I have been thinking about this for awhile now. After Sunday’s attempted theft (on my top box), I figured that my soft panniers won’t cut it (security wise) if I were to travel up north. Looking very top heavy and rear wide. Something just seem missing with the huge top box mounted. I have a 48L Shad top case and I just love the amount of storage space it provides. But for a multi-day trip, the top case alone isn’t enough. Also, the 48L Shad looks a little big’ish on my smallish bike – the Pulsar 200NS. I figured a set of panniers would compliment it well – both in terms of additional storage, and in terms of aesthetics. I’d prefer something that will still give me the ability to lane-split. So I was looking for something not too big. And after some research, I narrowed to the Givi E22N ($250 from Universal Motors) or the Kappa K22 ($190 from LAB). Honestly, I cannot tell the difference between the two. They look identical. 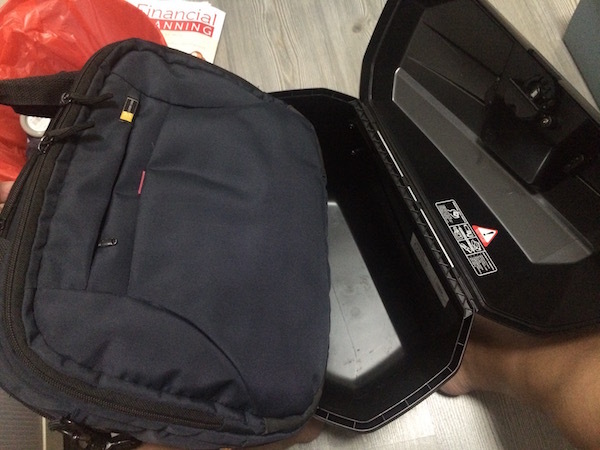 Both are 22L capacity each side. Some claim it’s produced from the same factory. Anyway, I went with the Givi for 2 reasons. Firstly, it’s GIVI vs Kappa – online research suggested that Kappa may actually be a “cheaper” or “lower quality” sister of Givi. But more importantly, I went with Universal Motors as being distributors of Bajaj, they are more familiar with the installation of this side case on my 200NS. I’ve heard some good, and some not-so-good things about LAB’s workshop. Anyway, installation was an additional $30. But from what I observed on the amount of effort it requires, I’d gladly pay for some expert hands here. 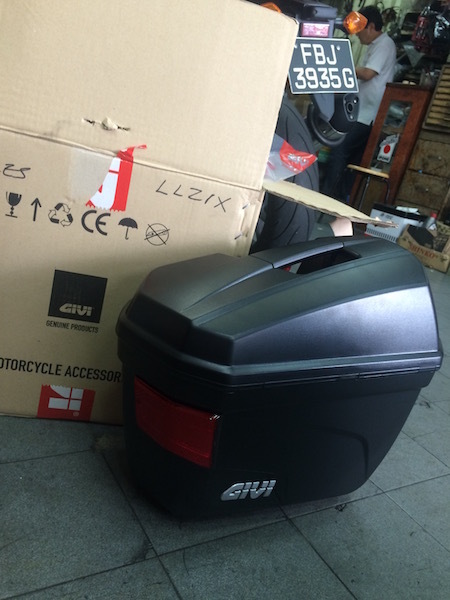 The Givi E22N fresh out of the box. Made in Malaysia. One side up. The other side to go. Adjusting the left side to look symmetrical. Ta da! Both sides up! Located 2 blocks away from Universal Motors Bajaj workshop, these guys ARE UM too! There! So much better! And so much more storage space! Ready to tour! That’s my laptop bag there. It’s actually bulkier than it looks. 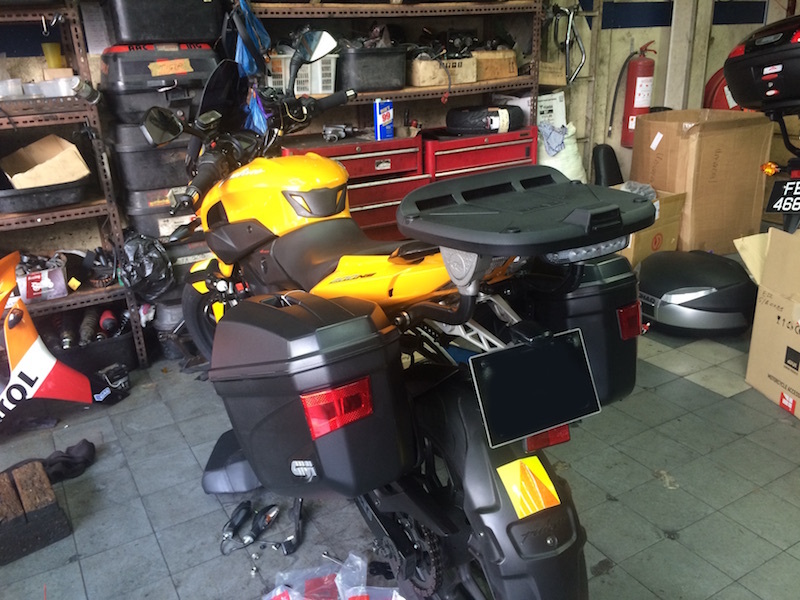 The Givi E22N side box takes in the laptop bag easily with much room to spare! Because I wanted the side boxes to hug the bike as closely as possible, I had to relocate the rear signal lights a little rearwards and slightly inwards. Wasn’t a big issue, and it was easily done. Direct front and rear view. Profile of the E22N’s still look pretty slim. Top-down view of the Givi E22N’s. Front view as close to what I really see as possible. Overall panniers width still within width of handlebars. 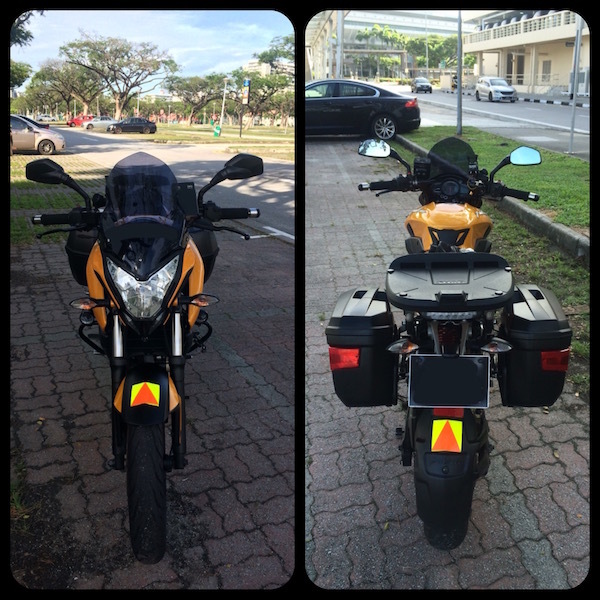 So lane-splitting is still easy and possible with the Givi E22N. Overall, I’m pretty happy with the side boxes. Gives me an additional 22L of storage space on each side – that’s 44L total. Add my 48L top box and I have about 92L of total storage space on my bike. That should be enough for my next multi-day trip… I only wonder when. Edit: Found this video of an Indonesian 200NS with the same panniers mounted. This is how I *didn’t* want to mount it. In my opinion, they are mounted too high (may affect bike’s handling more) and too wide (decreases lane-splitting ability). That said, this manner may be more comfortable for the pillion (not my consideration), and slightly easier to access the lock (not a big issue for me). Wow nice neat side panniers! Are those working red lights on the rear of the panniers? Or are they just reflectors? Would be very coool looking if they were working red lights! can those hold a fullfaced helmet? just wondering. Most definitely NOT! Not even an open-face helmet. 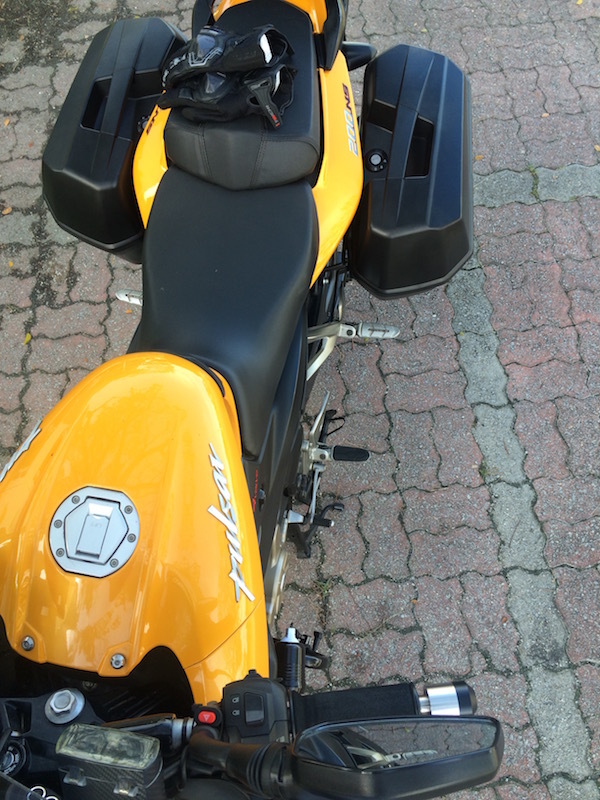 I have the same panniers but mine lights up yellow when the bike ignition is turned on. The E22 boxes are great. Just enough space and not too wide. Plus they are true top-loaders: one of the reasons aluminum ammo cans are so popular is that they are top-loaders, which prevent items from unceremoniously falling out of the box when you open them in a hurry. 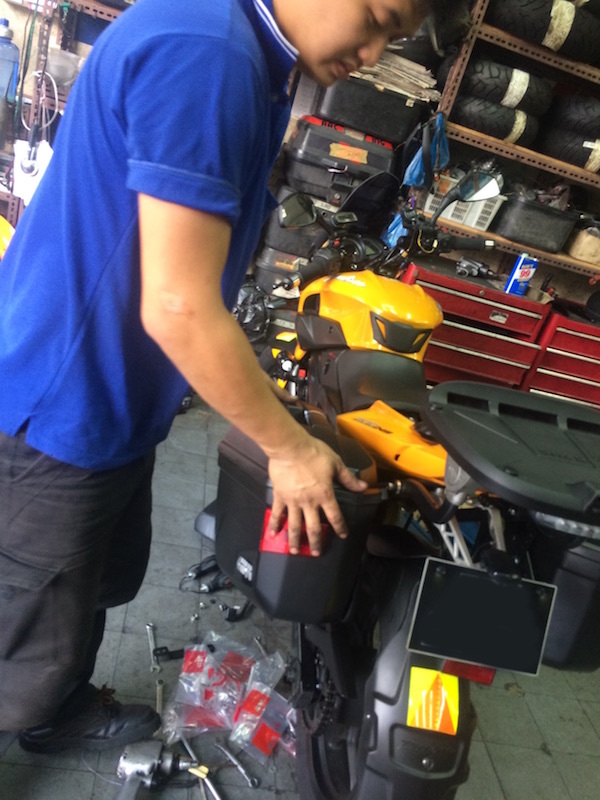 Even Givi’s own Trekker series are not true top-loaders which can be a hassle when you are trying to put a riding jacket or pair of riding pants into them. Yeah – I love them! In fact, I’m using them right now on my epic trip! Would you happen to know if, apart from the E21, are there any other bigger Givi (or otherwise) boxes that will fit on the E22 rack system? I like to have the option of carrying larger side boxes for long tours and revert to the E22 easily when running locally – all without having to re-rack the system. Thoughts? Okay, replying to my own comment, I’ve also purchased the GIVI E36N’s as larger side cases that would fit the same mount. These boxes provide A LOT larger space for extended touring on my motorcycle. For day-to-day use and for short trips, the E22N’s will still do fine – and still maintain lane splitting abilities too. Correct. It was $250 at Universal Motors. 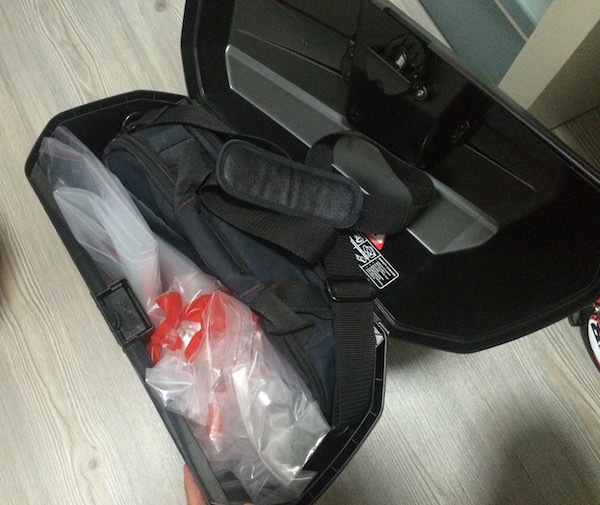 I got my Shad 48 top case + LED + backrest from Chong Aik. I think they have a promotion from time to time. Check with them. Hello, would just like to ask if you have a close-up pictures on how your HR4 bracket was mounted as well as the SB-2000s. I really wanted to install side panniers for my NS. However, it’s hard to find competitive mechanics in our area, not to mention there aren’t really Bajaj authorized shops from our country, IIRC. I really hate mediocre work. So I think reference pictures would be of great help. TIA! 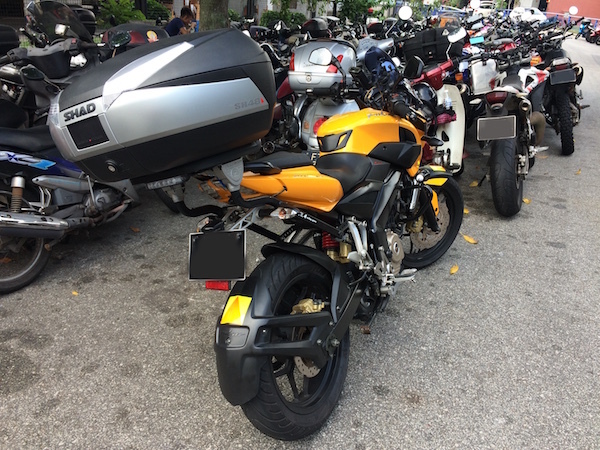 There are no pannier nor topbox racks built specifically for the Pulsar available here in Singapore. The HR4 and SB2000 are “universal” racks. So it will really depend on how you want it mounted. If you want a proper job and don’t mind spending some money on it, purchase the sb2000 (only) and bring it to Bike Fabricator to get them to manufacture a customized top rack and planner bracket. They will weld directly onto the SB2000. I recall seeing a 200ns who did a customized rear rack there. 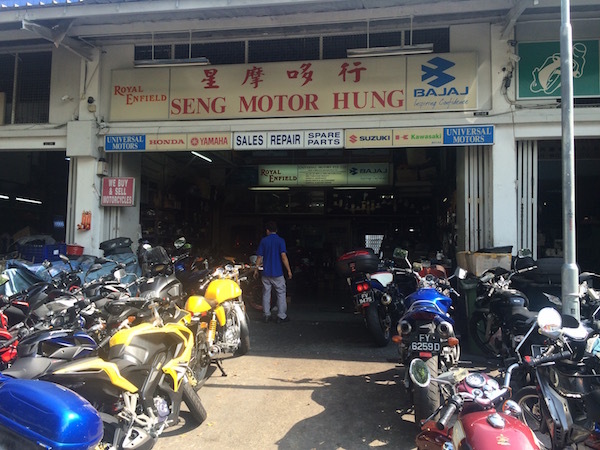 BTW, yes there is – Universal Motors is the only Bajaj authorized workshop / dealer / distributor here in Singapore. I’m actually from the Philippines and Bajaj bikes are assembled and distributed by Kawasaki Motors. On a side note, the Pulsar series are actually called Rouser here. Sure Kawasaki offer Aftersales support, OEM parts and services but that ends there. On the other hand, I already have an HR4 bracket. I’m thinking of something that would just be a bolt-in to the whole pillion. For repair, maintenance and fickle mindedness purposes. Haha. The SB2000 comes with an assortment of brackets. It’s a mix-and-match activity trying to get the right combination to work on your bike. Sorry – can’t quite help you there. I didn’t do the bolt on myself – I got a local mechanic here to install it for me as you can see from the above blog post. Alright then, but may I request some pictures on how it was installed? That would likely give me a good idea of do’s and dont’s. Also, I can agree that aftermaket parts are not available even here. We have a local company called SEC that manufactures, distributes and repackages some aftermarket motorcycles accessories from I don’t know where they’re getting. They even clone boxes and have a line of helmets of their own. But looking at their selections, I can’t seem to find anything for Bajaj motorcycles. 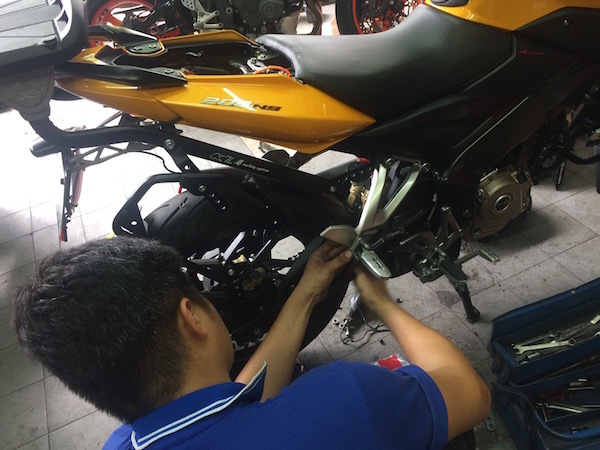 What we do have is an array of Bike lovers that design and manufacture aftermarket accessories, getting from fly-by-night craftsmen and selling them for a very profitable amount. But you can’t really trust them. Aside from them giving out mediocre yet expensive products, the designs aren’t that great, plus there aren’t much aftersales support too. There aren’t that much choices for Adventure riders here. The general mass of riders are inclined with street racing or by just going “faster” more than anything else. Hi! I’m wondering, does your side boxes affect the rear seat? Is it still comfortable for a passenger to sit on? I have never had a pillion. 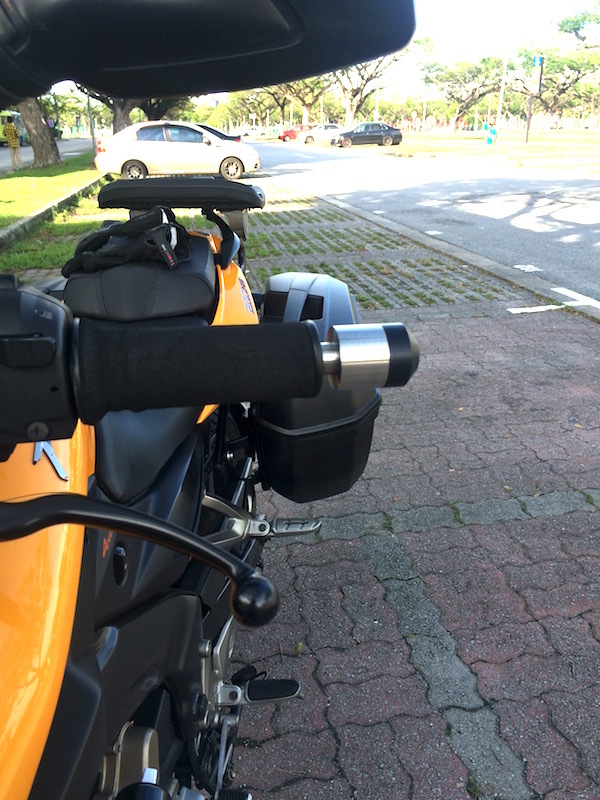 But after the adjustments Givi did for me in Penang, it looks a lot more comfortable should there be a pillion (greater foot rest area). Thanks man! I just bought a 200NS (2016) just last month, so I’m trying to look for cool mods, and the side boxes make sense. 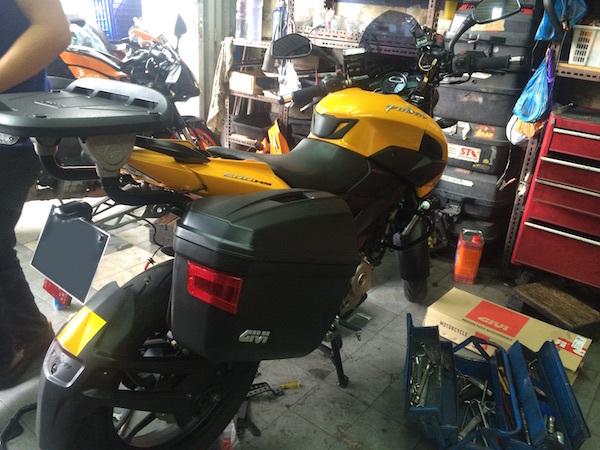 But if I had to choose between a top box or the side boxes, which one is easier for riding? Side boxes put the loads lower and forward as compared to a top box – and so, it affects handling less than (loaded) top boxes. Thank you! Will keep that in mind! Hi. Really helpful blog with tons of incredible useful information. I would like to ask you where are the attachment points for the top and side boxes exactly? From the pictures you provide seems that top box is attached to the peg base and plate/side lights holder, right? But I can’t find about side boxes. Currently I live in Indonesia and in all places I’ve been they always attach the boxes as on the video above. In my case, the pannier brackets are attached to the same mounting points as the topbox rack. Thank you so much for your kind and fast response, D! Thinking of these boxes for computing and need to fit a laptop in. Was that a 15″ laptop? I don’t have a 15″ laptop. But it fits my laptop bag that should be able to hold a 15″ laptop. I guess that depends on what you mean by “affect”. The pillion will definitely notice it being there. But it’s not uncomfortable at all for the pillion. I realised you changed your side penniers later on.. How come? 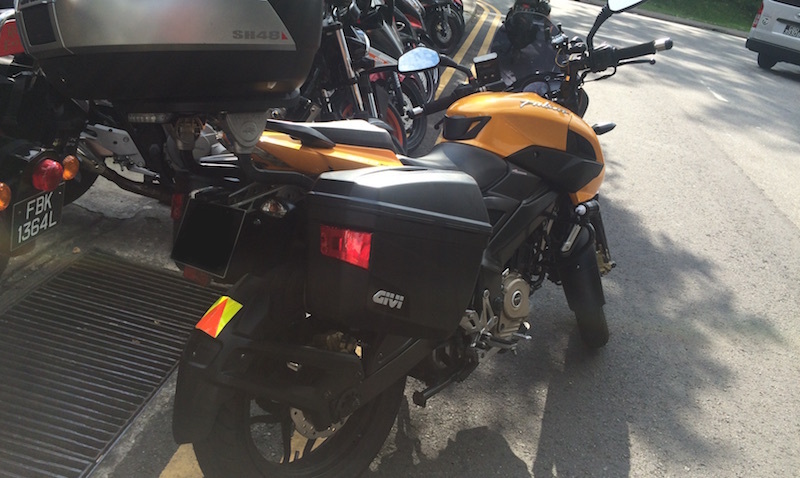 Does the GIVI E22N affect your lane splitting? Because I changed my bike. The E22N’s are probably the slimmest profile panniers you can get. Hi D, may I know what windshield are you using? And where did you got it from? Thanks! If you’re referring to the one on my Pulsar, I got them from a group buy who arranged the purchase from Indonesia. Any idea how I can get someone to ship the SB2000 to a US address? Specifically an FPO address? Those are apparently not sold in the US or Europe! Sorry – can’t help there. I don’t know of any shops in Singapore that ship internationally.